It is about the infant and the Mom and her responsibility to nurse or breastfeed the baby when it is hungry. On one hand it emphasizes on the infant’s right for food and more about the privacy factor with regard to the mother on the other hand. While the law of the land varies from country to country when it comes to breastfeeding in public, it is widely considered as a private affair just between the baby and the mother. Not all the mothers get the opportunity to breastfeed the baby sufficiently for few months without hindering their work and still care for the well being of the child. Across the world the propaganda that is done by the department of Women and child health care, on the benefits of feeding mother’s milk to her child has been on the rise and the efforts are laudable. But when it comes to practical ways of life it confines women to four walls for months and sometimes a year and above when it comes to the responsibility of child rearing and nursing as the mother and the infant needs are inseparable. Women belonging to developed countries too face this problem of sitting at home all the time while they miss out lot of time and miss their career growth. There is hardly any public rest rooms or feeding rooms where women can feed their baby in. This problem is prevailing in the airports of developed countries too. Recently there was an incident at the airport where the mother had to prove that she was really lactating and breastfeeding her baby for security reasons. Is your airport breastfeeding friendly? It is a million dollar question. There were reports of a nursing mom loitering in an airport searching for feeding rooms and to her dismay she had to sit in a toilet to breastfeed her baby. The whole issue zeros down to privacy and our determination to overcome difficult situations and turn them around in our favour. 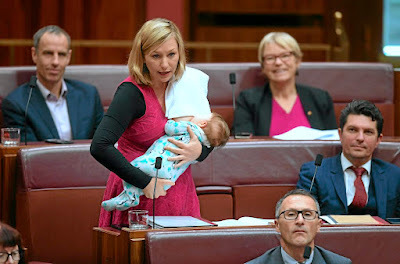 Interestingly, the news about the Australian Senator Larrissa waters has become the first Politician to breastfeed her baby in the Parliament. When questioned about it Ms Larrissa replied, "It's frankly ridiculous, really, that feeding one's baby is international news. Women have been breastfeeding for as long as time immemorial. "I had hoped to not only be able to feed my baby but to send a message to young women that they belong in the parliament." It is all about how to juggle politics with parenting, isn’t it? While this is one side of happening in the world there is another incident where the lady who was breastfeeding in the court during the proceedings was asked to leave the court room. The judge ordered that either she zips up or leave the room. Many backward countries of the world consider breastfeeding as the right of the woman but still consider public nursing is not an acceptable one. Lulamom to put an end to this much debated controversial subject on the right of the infant and the parenting duty of the mother has come up with the wonderful product which ends the search for feeding rooms, toilets and private places for the feeding mothers. The product is affordable, easy to carry, easy to use and soft on the baby’s skin. It is the boon to the parent on the move. It is the feeding cloak. The cloak is so handy and serves the purpose for the infant to immediately nurse when it is hungry, no matter where the mother is. It is definitely a product to buy for personal use, it is a perfect gift for family and friends, a must accessory for the parents who like to travel, the mother who loves to get out of the four walls to live her life to do her world of things that she would love doing.